great race are but a tale to be told. I am the last of my kind. The film begins in a prologue, where Vlad III the impaler fights for Romania as a knight in the Order of the Dragon. He defeats an overwhelming Turkish invasion of 1462. Upon returning home, he finds his beloved wife Elisabeta dead, having committed suicide upon hearing the false reports of his death in battle. Enraged at his wife being eternally damned, Dracula desecrates his chapel and renounces God, declaring that he will rise from the grave to avenge Elisabeta with all the powers of darkness. Over four centuries later in 1897, Jonathon Harker, a law firm clerk, travels to Transylvania to arrange the transfer of Carfax Abbey in London, Count Dracula's newest real estate acquisition. At the castle, full of bizarre, unnatural features and shadows that move by themselves, Harker meets Dracula, a wrinkled, pale old man in brilliant red robes. During the final signing of the real estate papers, the Count caresses a picture of Harker's fiancée Mina Murray, the reincarnation of his long dead wife, Elisabeta. Dracula then sets sail on the ship Demeter to England, leaving Harker captive by Dracula's insatiable and bloodthirsty Brides, who systematically drink his blood, leaving him too weak to escape. 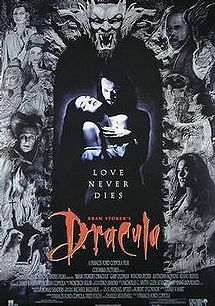 Dracula arrives in London in a box of his native soil, which is transported to the Abbey, where Dracula emerges to ravish and drink the blood of Mina's best friend, Lucy Westenra. Dracula, now a young and handsome prince, meets and gradually charms Mina, but refuses to bite her, instead offering her absinthe to aid her recollection of her past life. As the two fall deeper in love, Lucy's deteriorating health and noticeable behavioral changes prompts suitors Quincey Morris, Dr John Seward and Arthur Holmwood to summon Dr. Abraham Van Helsing, who during a blood transfusion recognizes Lucy as a vampire victim. In Transylvania, Harker escapes to a convent and writes to Mina, who despite misgivings does as Lucy suggests and goes off to marry him. On the ship she writes that she still feels the presence of her "strange friend", and misses him. Dracula, grief-stricken and enraged, murders Lucy to transform her into one of his vampire brides. After Lucy's funeral, Van Helsing leads Holmwood, Seward and Morris to the family crypt, where Lucy has risen as a vampire. Horrified, Arthur drives a metal stake through her heart while Van Helsing decapitates her with a large knife. Newlyweds Harker and Mina return to London and join Van Helsing, Seward, Morris and Holmwood in hunting Dracula. They arrive at Carfax Abbey and destroy his boxes of soil. The Count, who watches from the shadows, travels to Mina and confesses that he is dead, a hunted creature and the murderer of Lucy. While confused and afraid, Mina still loves him and wants to be with him. As she begins drinking blood from Dracula's chest, the vampire hunters burst into the bedroom, with Dracula claiming Mina as his bride before disappearing into the shadows. As Mina begins changing the same way Lucy had, Van Helsing hypnotises her and learns via her connection with Dracula that he is sailing home. The Hunters depart for the port of Varna via train to intercept him, but discover that Dracula has read Mina's mind and evades them. The Hunters split up, with Van Helsing and Mina traveling to the Borgo Pass and the Castle, while the others try to stop the gypsies transporting Dracula. At night, encamped at the castle, Mina begins changing as the Brides hover nearby. After attempting to seduce Van Helsing she bares fangs, but is rebuffed. As she returns to her human form, Van Helsing surrounds them both with a ring of fire, warding off the Brides until morning, when he wearily infiltrates the castle and kills the Brides as they sleep by decapitating them. Hours later, as sunset approaches, Dracula's carriage appears on the horizon, driven by gypsies and pursued by the Hunters. Dracula, sensing Mina's presence, telepathically commands her to summon a spell that casts harsh winds to impede the Hunters. The carriage finally arrives at Castle Dracula and a great fight that pits the Hunters vs the Gypsies. One gypsy stabs Morris, gravely injuring him. Just as the Hunters kill the last gypsy, the sun sets and Dracula bursts from his box. He fights with supernatural strength but cannot overpower Harker, who slits the Count's throat with his own knife while Morris stabs him in the heart. As the Count staggers, Mina rushes to his defence with a rifle. Holmwood tries to attack but Van Helsing and Harker allow her to retreat with the Count, turning instead to Morris, who dies while surrounded by his friends. In the castle Dracula lies dying. His body ravaged by age, he rebuffs Mina's attempts to pull the knife from his heart. They share a last kiss, as the candles adorning the chapel miraculously light, and the desecrations he committed on the altar are repaired. As he asks Mina to give him peace, she shoves the knife through his heart and decapitates him. Mina then looks hopefully up at the vast ceiling, where a painting of Vlad and Elisabeta is shown of them rising, together, up to heaven.